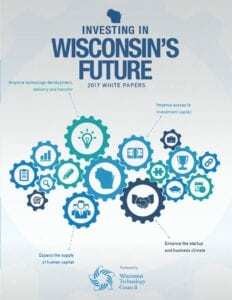 Improving access to capital for Wisconsin entrepreneurs, building the supply of human capital, enhancing the startup and business climate, and improving tech development, delivery and transfer are four major themes of the Wisconsin Technology Council’s 2018 “white papers” report. 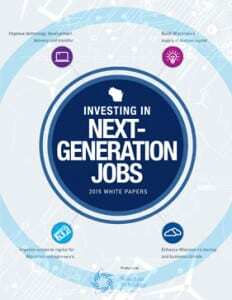 As the state weighs its budget priorities for the next biennium, policymakers need to hear ideas that focus on the creation of next-generation jobs for Wisconsin – and keeping our best and brightest young people at home. 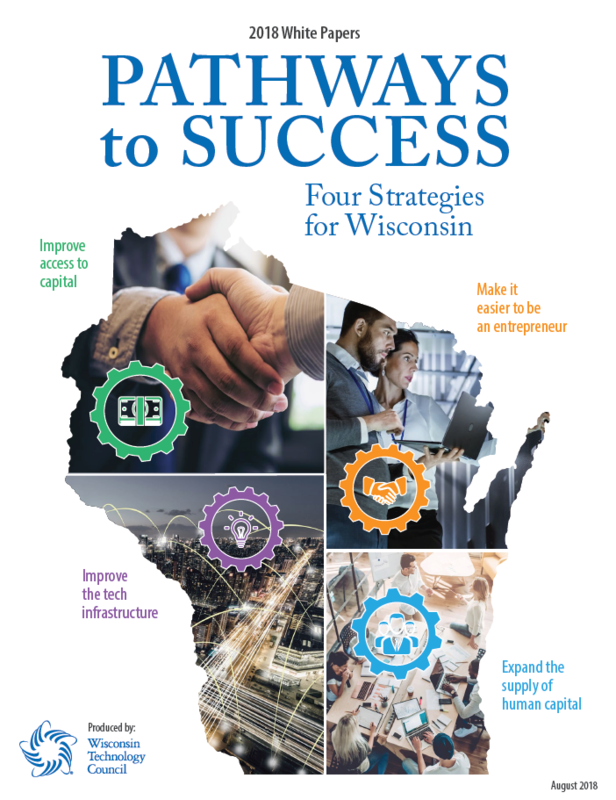 Similar to the 2018 White papers, iImproving access to capital for Wisconsin entrepreneurs, building the supply of human capital, enhancing the startup and business climate, and improving tech development, delivery and transfer are four major themes of this year’s publication. The ideas offered in the Tech Council’s 2015 white papers are intended to renew the public discussion about improving the state’s tech-based economy. They include emerging priorities as well as restatements and updates from previous white papers, legislative proposals or executive branch proposals. Some are based on our knowledge of innovative ideas in other states. And many are ideas brought forward by members of our Wisconsin Innovation Network and others – entrepreneurs, investors, service experts and researchers — who attend our events and seminars. 14. Extension of funding for the WiSys Technology Foundation, which assists UW System campuses in transferring technology to the marketplace. The 2008-2009 version of the Tech Council’s “white papers” have been delivered to the governor and the Legislature. Our board members believe these ideas will be helpful to state policymakers as they consider ways to expand and invigorate the Wisconsin economy as part of their state budget deliberations. Some of these ideas are new. Others are restatements and updates from previous white paper reports, legislative proposals or governor’s office proposals. Some are based on our knowledge of successful programs in other states. And some are ideas brought forward throughout the course of the year by entrepreneurs, researchers, investors and others who deal daily with issues surrounding the tech-based economy in Wisconsin. Development of the tech-based economy in Wisconsin is taking place across all sectors and throughout various regions, but it appears more strategies aimed at rural Wisconsin may be needed. Here are four ideas in that category. 1. Promote rural Wisconsin as a “farm-shoring” location for tech-based companies. Farm-shoring, or the outsourcing of work to domestic rural locations, is gaining visibility among companies that would prefer not to ship U.S. jobs overseas. The cost of living, wages and work ethic in rural areas can compete with the cheap labor touted by offshore providers, especially when other advantages are considered. Those factors include avoidance of: cross-cultural confusion, transnational legal issues, some security problems and time-zone differences. Forward Wisconsin could be a “messenger” in this regard. 2. Improve broadband and cell phone penetration. Higher broadband penetration allows small businesses, which account for 60 percent of new jobs in Wisconsin, to expand to national and international markets. It creates more opportunities for creation of businesses related to information technology, one of the fastest-growing sectors in the U.S. economy. It enables hospitals and clinics to better utilize telemedicine applications. It provides rural Wisconsin residents with greater access to higher education through distance learning. Cell phone coverage may be just as important: A poor cell phone signal is at least an annoyance and often a deal-killer for business location specialists. 3. Make better use of state Technology Zone tax credits. Some communities have used them effectively; others have allowed them to languish. At some point, the governor and the Legislature may want to consider a statewide tax credits zone (it’s now regional) to reward those communities that have been putting the credits to work but who may now be bumping up against the ceiling. 4. Leverage New Market Tax Credits. Within Act 255 revisions, include a New Markets Add-on Credit that will have separate eligibility language. An estimated $19.5 billion will have been invested nationally through 2008, and legislation is pending to extend the Federal New Markets program through 2013, a program which is designed to target investment in low income communities. By adding a provision in Act 255 that augments the Federal tax credits for investments in operating companies in low income communities in Wisconsin, the state can be positioned to attract a disproportionate share of these investment dollars and broaden the participation across Wisconsin. In the case of New Markets Add-on Credits, the definition of eligible companies should be broader. In Wisconsin, there are more than 100 qualifying census tracts spread among 43 predominantly rural counties. 5. Propose that the Wisconsin Health and Educational Facilities Authority be authorized to issue bonds to finance any project undertaken by a research facility, or to refinance outstanding debt of a research facility. Project activities for which WHEFA may issue bonds include construction, acquisition, remodeling, furnishing and equipping of research facilities, related structures, and structures or items that are useful to the operation of research facilities. “Research Facility” means an institution, place, building or agency that satisfies all of the following: (a) Is owned by an entity that is described in section 501(c)(3) of the Internal Revenue Code, as defined in s. 71.22(4), and that is exempt from federal income taxation under section 501(a) of the Internal Revenue Code. (b) Is engaged in basic research, meaning any original investigation for the advancement of scientific, medical, or technological knowledge not having a specific commercial objective. 6. Create a Small Business Innovation Research (SBIR) program at the state level. The federal SBIR program provides more than $2 billion a year to small companies that are developing leading-edge technologies. Since its inception in 1982, the SBIR program has been a successful mechanism for fostering and commercializing high-tech innovations. The program helps small businesses stimulate the U.S. economy by targeting grants to encourage the development and commercialization of new technologies. Enacting a pre-Phase I program at the state level would stimulate entrepreneurism and prepare inventors to seek federal SBIR funding. The federal SBIR/STTR reauthorization process may lead to fewer small Phase I grants, creating the opportunity for targeted state involvement through Qualified New Business Venture companies. A related proposal was included in Gov. Jim Doyle’s “Accelerate Wisconsin” plan, which called for the doubling of current funding for technology grants and loans from $2.5 million to $5 million. A doubling of technology grants and loans through the Wisconsin Department of Commerce would help provide some of the “first money in” for promising start-up firms, and a necessary precursor to future rounds of private investment. 7. Enhance the competitiveness of Wisconsin firms competing for federal SBIR/STTR funding. Attracting funding for proof-of-concept related expenditures is critical to the success and the longevity of early-stage firms. While SBIR/STTR funding can mark a turning point in a company’s life-cycle, the process is long and complicated and the amount of funding available continues to shrink. That is why it is critical for firms to have adequate mentoring and logistical assistance available both through formal state networks, such as the Wisconsin Department of Commerce, the Wisconsin Entrepreneurs’ Network, the Governor’s Business Plan Contest, the Wisconsin Innovation Network and others. 8. Support proposals to attract federal research laboratories to Wisconsin. The successful effort to win a $135-million U.S. Department of Energy grant to create the Great Lakes Bioenergy Research Center was an example of public-private, as well as interstate, cooperation. The UW-Madison, UW System and Wisconsin’s leading private colleges and universities are well positioned to pursue other federal lab opportunities should they arise. One example could be a food safety lab, which would be a strong fit with existing research capabilities as well as Wisconsin’s food processing industry. 9. Support UW-Milwaukee efforts to expand research, including a $143-million engineering campus and research park in Wauwatosa. This would include other efforts to build a downtown “academic health center” as well as facilities to support UW-Milwaukee’s water technology programs. These proposals and related projects through the UWM Foundation and UWM Research Foundation would help increase the size of UW-Milwaukee’s research programs by roughly three-fold while enhancing economic growth in southeast Wisconsin. 10. Continue partnerships and efforts designed to bring Wisconsin innovations to the attention of the global economy. Those include the BIO International convention, the World Stem Cell Summit, joint exercises such as the Pfizer briefings, the “First Look Forums” instituted by the UW-Madison Office of Corporate Relations, the Governor’s Business Plan Contest and major state-based conferences such as the Entrepreneurs’ Conference and the Early Stage Symposium. 11. Organize an I-Q Corridor Agenda involving appropriate government and economic development groups from Illinois, Minnesota and Wisconsin to discuss common challenges and opportunities. This agenda could be formed at a Tech Council conference, such as the Wisconsin Entrepreneurs’ Conference. A possible “I-Q Corridor Agenda” could include pursuit of federal research dollars for major projects, such as high-speed rail; preserving the quality of the Great Lakes; and examining uniformity of state laws and regulations governing tech transfer and investments. The summit could build upon work begun by the Tech Council and the Committee on Institutional Cooperation (CIC), a consortium of the Big Ten universities plus the University of Chicago and the Federal Reserve Banks of Minneapolis and Chicago. 12. Support the efforts of the Public Service Commission of Wisconsin to explore the level of regulation of telecommunication providers in Wisconsin. The Tech Council has provided written (March 25, 2008) and oral (May 28, 2008) testimony to the PSC on this subject. Since 2003, the Tech Council’s white papers have consistently supported deregulation as a means for speeding technologies to market, providing more consumer choice, facilitating service in rural and other under-served areas, and instilling more competition. While the markets are not perfect, they are far preferable to pre-emptive regulation that is often out of date from its effective date. 13. Support efforts to increase Wisconsin’s access to out-of-state electric power, and the safe and efficient transmission of in-state electric power. This would include support for American Transmission Co.’s proposal to meet the energy needs of Dane County and other Wisconsin communities. 14. Continue to support passage of “e-scrap” legislation in Wisconsin. An electronic waste regulation bill came close to passage in the spring session of the Legislature. As proposed, it would have placed Wisconsin squarely into the national and international mainstream for recycling used computer components and other electronic devices with potentially hazardous materials. It could also create recycling jobs, especially at the entry level, while better positioning Wisconsin among an emerging international market. 15. Encourage the state to lift its moratorium on the construction on new nuclear power generation plants in Wisconsin. While no proposals to build such a plant are pending in Wisconsin, “next generation” nuclear plants operating elsewhere in the world – and a few planned for the United States and Canada – are safer, more efficient and produce no greenhouse gases. Nuclear energy is an important part of the nation’s energy portfolio, and should remain so if a goal is reduction of greenhouse gases. 16. Support the efforts of the Legislative Council surrounding two special study committees of interest to the Tech Council. Those committees are Building Wisconsin’s Workforce and Domestic Biofuels. 17. Investigate the cost and benefits of an overall Biosciences Strategy and action plan, similar to those performed by Battelle in states such as Colorado, Ohio and Arizona. Such a study would build upon past work – such as the Tech Council’s “Vision 2020” report and our recent inventory for the Wisconsin Security Research Consortium – to provide a concise summary of research strengths, potential technology platforms, product niches and market potential for each platform. 1. Encourage educational institutions to collaborate on workforce issues. It’s hard to live more than an hour’s drive from a four-year college, a two-year college or a technical college in Wisconsin. In most of rural Wisconsin, one of each is within range. Those institutions can do a better job of collaborating to address workforce issues, which often trouble business owners in smaller communities and urban centers. Cooperation with K-12 districts is also essential, as these schools lay the foundation. Testing and assessment in K-12 should be more than a summary of what students learn; it should be formative and help adjust curricula to meet 21st century needs. Schools at post-secondary levels should take into account predicted shortages in selected professions and trades, such as health care, certain manufacturing jobs and information technology. For example, it is estimated there will be four job openings for every IT graduate by 2012. Efforts by the PK-16 Council to move ahead with specific actions should be supported. 2. Consider increases in student financial aid for higher education. Affordable access to higher education, from the technical colleges to the UW System to Wisconsin’s private colleges, is an emerging challenge. Tuition increases will be necessary to meet instructional budgets and to preserve quality. A corresponding financial aid strategy at the state level can help ensure access for families and students. 3. Encourage the governor and the Legislature to adopt an Education Tax Credit to help the marketplace fill key voids in the supply of college-educated workers. It would provide employers a credit equal to 50 percent of tuition paid at any Wisconsin college, university, or technical college for qualified individuals. An Education Tax Credit would leverage private investment in education, especially for those low-income groups that are not fully participating in the “knowledge economy.” It would promote company investment in current and prospective employees. It would allow employers and the marketplace the opportunity to make workforce training decisions. 4. Support efforts to enhance STEM education. State and national workforce demands, as well as fundamental national security, underscore the need for more students who are skilled in science, technology, engineering and math. This is unlikely to be accomplished by merely requiring an additional semester or year of instruction. It is more likely to be accomplished by relying on innovative public and private programs that engage students at critical points of development. Initiatives such as Project Lead the Way, First Robotics, STEM Grants through the state Department of Public Instruction and the national STEM Equity Pipeline are examples. Creating incentives for public and private school teachers to learn new practices and skills are also part of the solution. 5. 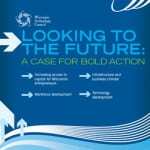 Recommend that Wisconsin workforce development strategies take into account the energy efficiency, wind and biofuels workforce goals of Clean Energy Wisconsin, released in spring 2008. Jobs required include energy and indoor air quality auditors, insulation workers, HVAC operations and maintenance technicians, carpenters, plumbers, electricians, wind energy technicians, mechanics, sheet metal workers, machine tool operators, plant technicians, boilermakers and steamfitters. 6. Support elements of the UW Growth Agenda and the Technical College System’s “Next Generation Workforce” strategy to accelerate workforce development. Advantage Wisconsin, released by the UW System in early 2008, includes a number of recommendations. Recent Board of Regents policies have provided additional guidance. Most likely to produce results: (1) Consider other differential tuition policies, such as the policy adopted for the UW-Madison College of Engineering; (2) Create the UW Dual Transcript to capture out-of-classroom learning; (3) Embrace a campus-by-campus approach to transferring credits; (4) Offer UW “New Pathways” degrees to Wisconsin’s underserved adult population; (6) Build a Wisconsin “KnowHow2Go Network, enlisting undergraduates as ambassadors to schools and kids; (7) Collaborate with the PK-12 community to enrich college preparation and expand college offerings in high school; (8) Expand the UW-Madison “Connections Program,” which encourage students to begin at a two-year UW campus and finish their degree at UW-Madison; (9) Establish Wisconsin Idea Public Policy Forums that bring the university’s best research to bear of the state’s biggest challenges, and (10) Creation of specific centers designed to enhance tech development, such as the Center for Public Opinion and Tech Transfer in the UW-Madison Department of Life Sciences Communications. The Next Generation Workforce strategy includes specific sector-based programs designed to meet the needs of employers in the 16 tech college districts. 7. Support creation of a new major in computer engineering at UW-Stout. The program will emphasize the design of hardware and software for engineering systems that use embedded digital processors, such as microprocessors, microcontrollers, digital signal processors and personal computers. UW-Stout now offers a Bachelor of Science degree in engineering technology with a concentration in computer engineering. This idea has been approved by the UW Board of Regents. 8. Encourage the Board of Regents to review “conflict of interest” rules that may slow or even prevent the transfer of technology from the laboratory to the marketplace. Faculty should be encouraged to pursue entrepreneurial ventures, collaborate with private industry, commercialize research results, take part in appropriate business plan contests, and pursue entrepreneurial ventures without penalty. So-called “safe harbor” agreements at other universities may serve as a model. Top recommendations in this category relate to expanding and revising the Act 255 early stage tax credits, funding access to capital initiatives and creating a capital gains tax exemption for investments in start-up companies. o Increase the pool of credits, extend the time period, and insure there are no caps on eligible investments in any one year: The annual pool of available credits should be increased to $50 million, creating an incentive for $2 billion in annual investment by angels and qualified state funds, beginning 2010 through 2019, bringing Wisconsin to about one-third the national per capita average. Permit investors to claim the first available credit, potentially accelerating the pace of investment and state revenue generation without increasing the state’s annual costs. o Increase the aggregate cap for tax credit eligible investment to $8 million from the current $4 million: The type of companies targeted with this legislation commonly need between $15 million and $75 million (or more) in equity financing to reach cash flow breakeven. The current available credits do not get companies far enough down the development path to make equity capital more accessible. o Allow the total $8 million to be invested by any combination of angel or venture capital sources. o Allow the total $8 million to be invested by a single venture capital firm. This would encourage the formation of venture capital funds in Wisconsin that are more comparable in size to the national average. o Expand the eligibility language: Unless specifically prohibited in the legislation, companies covering the full range of technology sectors backed by the angel capital community and venture capital industry should be eligible for certification in the program. o Make the venture capital tax credits transferable: Permit the sale of tax credits, but place the burden on the funds to track the holders of the tax credits and report the eligibility to the Department of Revenue. o Allow the venture capital tax credits to be applied against gross premium taxes paid by insurance companies: Broaden the type of taxes against which the credits can be applied, particularly to include gross premium taxes paid by the insurance industry. o Permit rollover of capital gains: Permit venture capital fund investors to defer capital gains tax by placing gains from a venture investment into a segregated account until the cumulative capital calls by the fund generating the gain, or by the next fund formed by the fund manager, result in a new venture capital fund investment by the investor. Enable angel investors and investors in venture capital funds to defer capital gains if they reinvest their gains in another Qualified Business within a year. o Create an improved appeal process and track tax revenue generation: Companies deserve an opportunity to appeal a denial of qualification and be confident that the party considering the appeal is different from the party that made the original denial decision. Commerce should have appropriate reporting and staffing to track the bill’s effectiveness. o Limit tax credit recapture to individual transfers: The last budget bill amended Act 255 to provide a rule that tax credits would be recaptured if the investment is transferred within 3 years. While this may make sense for an individual who decides to sell in a one-off transaction, it should not apply where it is the result of a merger or acquisition not controlled by the tax credit recipient. 2. Encourage the governor and Legislature to reduce state capital gains taxes on investments in high-tech, high-growth companies. This is similar to past proposals by the Tech Council and Gov. Jim Doyle. It will increase investment in new Wisconsin businesses by allowing individuals a limited 100 percent capital gains exclusion of up to $10 million for long-term capital gains reinvested in qualifying Wisconsin businesses. Requirements may include requiring investments in firms that are Wisconsin-based with at least 51 percent of their employees in Wisconsin; engaged in a “high-growth” industry; demonstrating annual revenue growth of 20 percent or more; and total employment of fewer than 500 employees. It’s a targeted break that would unlock money that could be redirected to high-growth investments in Wisconsin, encourage investments in companies that produce high-end jobs, lower the cost of capital available to qualified entrepreneurs, and speed technology transfer. It also democratizes private equity investment by encouraging a whole new category of investors – those who may have made money on stocks, real estate or other property – to reinvest their money at home versus other states. 3. Encourage the state to include funding for the Wisconsin Angel Network in the 2009-2011 Governor’s budget bill. This program was initially funded by Commerce and the Department of Financial Institutions; there is no current state funding. It continues to be supported through the Tech Council and other sources. 4. Encourage the governor to support a proposal for the Wisconsin Venture Capital Network, most likely in a private-public form. This proposal is being drafted by the state Department of Financial Institutions. 5. Allow life sciences companies to spread deductions for net operating losses incurred from certain business activities over 20 years. This proposal would double from the current 10 years to 20 years the length of time life sciences and other tech startups have to write off losses. California is expected to soon pass the 20-year rule, joining 28 other states and the federal government. It is designed to account for the roughly 15 years it takes biotech and pharma companies to develop and obtain approval for a new drug. 6. Exempt R&D materials from the state sales and use tax. The Governor’s 2007-2009 state budget proposal would have created five sales and use tax exemptions related to biotechnology. Three of the exemptions would apply directly to biotechnology businesses, while the other two would apply with respect to businesses raising laboratory animals that are sold to biotechnology businesses. Currently, there are no sales and use tax exemptions specific to biotechnology. A Tech Council memo from April 2007 explains how that proposal could be rewritten and improved. 7. Urge adoption of tax credits/refunds targeted at specific high-tech, high-growth industries. According to the National Science Foundation, just six industries account for three-quarters of industry-based R&D and 95 percent of federally funded industry R&D. Those industries include electronic products, chemicals (including pharmaceuticals and medicines), computer-related services, aerospace and defense manufacturing, R&D service industries and automotive manufacturing. Tax credits/refunds should be targeted at those industries that have the highest R&D intensity and in which Wisconsin has a competitive advantage, such as life sciences, medical devices, biomedical engineering, water technologies, medical imaging, computer design, data processing, energy efficiency, biofuels and control systems. Several states have enacted a Super R&D Tax Credit. Firms are eligible for the credit if their qualified research expenses increased by at least 50 percent over their average expenditure for the previous three years. Qualifying companies are awarded a credit in an amount equal to any new spending in excess of their three year average. This is similar to a proposal made by Gov. Jim Doyle in late 2007. Concurrently, we recommend a review of existing tax credits with an eye toward consolidation and or “sun-setting” of those that may have outlived their usefulness. These papers stemmed from deliberations by the Tech Council board of directors, and were written by Tech Council staff familiar with the challenges and opportunities facing Wisconsin’s tech-based economy. We hope they prove helpful to Gov. Jim Doyle and the Legislature as they look ahead to the 2007-2008 session. The following is a summary of ideas that surfaced within the four standing committees of the Wisconsin Technology Council, which is the independent, non-profit science and technology adviser to the Governor and the Legislature. Those standing committees are Technology Development, Investment Capital, Human Capital and Outreach and Public Policy. There are many barometers by which to measure the success of technological development, but none more poignant than the ultimate effect that technology has upon the lives of our citizens. That effect can be measured in per capita income. To give Wisconsin’s economy the competitive edge that is necessary to increase its per capita income above the national average, a situation which we have not enjoyed for some time, new discoveries and technologies must be used to feed innovation in products and services. The goal of the Wisconsin Technology Council’s Investment Capital Committee is to increase the amount of venture capital, angel capital, federal funds and other investment capital available to Wisconsin tech businesses. To that end, the Committee has met and considered numerous proposals to achieve this goal. In the late 1980s, the slogan was, “It’s the economy, stupid.” But, in today’s economy, stupidity will not move Wisconsin forward. We propose a new slogan: It’s the people, smarty. The Knowledge Economy is dependent on educated people for success. Education itself can no longer be seen only as part of the infrastructure or as a means to an end. Rather, education is an economic cluster, a generator of wealth, and an export industry. This report will present ideas for building a stronger infrastructure for technology business and job growth in Wisconsin. Some of the ideas relate to the physical infrastructure of Wisconsin – such as its transportation, energy and telecommunications systems – while others relate to building policies that better support technology businesses and workers.